Conventional cabinets are a large source of VOCs in the kitchen, with all conventional brands using some kind of pressed wood, MDF, plywood or particleboard (or melamine with a particleboard interior) which typically give off formaldehyde. Finishes are likely to be toxic unless stated otherwise. 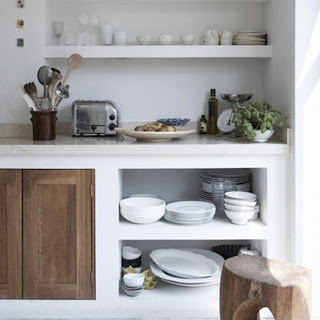 Healthy cabinets would be made of solid wood, 0 VOC plywood, or metal. Sometimes glass or MgO board can be used. Of course, some are sensitive to the smell of wood and wood can also pick up and hold onto secondary odours. My cabinets are solid wood, but the reason cabinets are made of pressed wood products is that solid wood can warp in the kitchen. This post contains Amazon affililate links. There are companies that make metal kitchen cabinets, such as Fillip Metal (high end) and Bertolini (more affordable, 100% metal). Fadior makes stainless steel cabinets. IMD has no wood and no adhesives (North American and Europe). When shopping for metal cabinets you want to see if there are any non-metal components. Healthy Cabinet Makers make solid wood cabinets aimed at the chemically sensitive. There are a large number of companies, Neil Nelly Cabinets, for example, that make low-VOC wooden cabinets (test for your own sensitivities). The company KERF makes cool looking cabinets out of Purebond (formaldehyde-free) plywood, and zero-VOC finishes (some people do react to Purebond). Another popular brand is Crystal Cabinets, the main issue here is with their finishes, but you can finish them yourself. Here are some non-toxic finishes. There are many other brands in this category but you have to look carefully at them. Some of the same companies that make kitchen cabinets also make, bathroom vanities and closets. Here is a company making solid wood closets. Tiles: A good option other than the fact that the grout will need to be sealed regularly and could still become susceptible to mould. A good non-toxic tile sealer is AFM Grout Sealer. You can also find solid porcelain countertops now like iTOP|Ker which look like a good option. Butcher Block: The glues may or may not be tolerable. Affordable. Check to see if it's solid wood all the way through. Solid Wood: More and more I'm seeing thick solid wood countertops. This can be a good option. Solid Slate: Find out if a sealant has been used. Concrete: Here is a non-toxic countertop mix that does not contain fly ash, vinyl or latex. Seal with AFM Safecoat 2K Pro Urethane sourced from GDC 262-446-6702. Granite and Marble: Find out what was used as a sealant and resin, or find a raw piece that does not contain either of those. Ubatuba granite does not need a sealer so that is a major plus side to that. The downside of most types of granite and marble is that it needs to be resealed every year or two and you need to make sure you can tolerate a sealer. If you can find a raw piece it can be finished with Tung oil (not tolerable for all). Other low toxin sealers are Meta Creme and AFM Mexseal. Test for radioactivity with granite. They don't always need plywood as an underlayment, it depends on the thickness. You could try using a different type of underlayment. Other Stones: Onyx needs a sealer that is reapplied every few years. Sandstone is a cool option, just use a non-toxic sealer. Soapstone is a good natural option that is usually sealed with mineral oil but can be sealed with Milk Paint Soapstone Sealer. Stainless Steel or Aluminum: Needs ground fault interrupter. Use non-toxic underlayment. Solid Surface: Corian is made from an acrylic polymer and alumina trihydrate and is GreenGuard Gold certified. Paperstone and Richlite are paper-based, claim 0 VOC, and are light options for trailers (Richlite is new paper, Paperstone is recycled). Recycled glass is very similar to quartz and is also considered as safe. Icestone is a brand that makes cement & glass countertops - they claim 0 VOC and need a marble/granite sealer. Durat is appealing because it might be the lightest option for a trailer, it is low VOC, polyester and acrylic (made partly from recycled cell phones). This may not be preferable for people with sensitivities. Another plastic option that is super light is Metem which is recycled HDPE and claims no offgassng. Avonite makes an acrylic option and a "resin" option that are GreenGuard certified. Tadelakt: Tadelakt counters are a unique and beautiful option. It needs to be a darker colour because it is susceptible to staining and needs a wooden edge, as the plaster edge is vulnerable. It requires some upkeep. 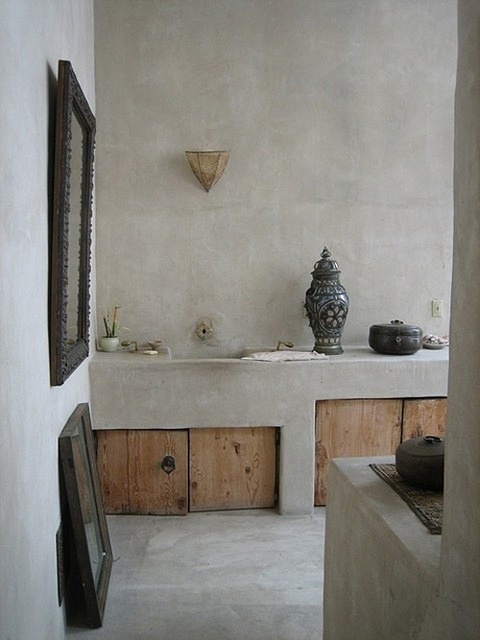 Here's a really handy how-to for earthen countertops. Tempered Glass: Tempered glass is costly but is a very pure option. A great glue for countertops if you do choose to use one, is Almighty Adhesive. It's extremely tolerable for a glue. There is a very unfortunate certification for faucets which is called "lead-free" but means the faucet can contain 0.25% lead. If you are concerned with lead (no level of lead is a safe level and it's difficult to chelate), you are looking for 100% lead-free faucets. The ones I have seen that are 100% lead-free are made of 100% solid stainless steel. Parmir claims to make 100% lead-free faucets but a client used these lead swabs to test a kitchen and bathroom faucet and the test proved positive. The other options for 100% lead-free faucets are pricy. 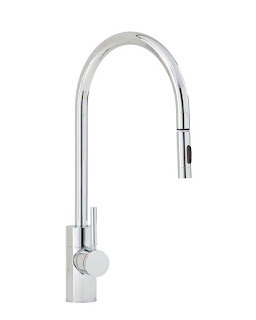 MGS an Italian company and Waterstone Faucets also make 100% stainless faucets. Another one I have seen is called Jerry. If you cannot afford a 100% lead free faucet you can add a certified filter to the tap like this Brita one which will remove lead. It's ideal to also have a whole house system or reverse osmosis (RO) as well to remove contaminants. The type of system needed depends on if you are on city or well water, and which contaminants your water contains. If you are on well water, a RO or charcoal system is not advised without having a primary UV or ceramic filter to take care of microbes first. Avoid non-stick cookware (Teflon) as it gives off perfluorooctanoic acid, something you do not want to be ingesting. Instead of a rice cooker which has a non-stick lining, I use the Instant Pot which can be used for rice, stew, soup, meat, eggs, veggies and so many other things. It has a stainless steel lining. It does need to be offgassed, like any appliance. Avoid aluminum and copper cookware as it leaches. Stainless steel is preferred with glassware where possible. Antique glassware/Crystal wine glasses can leach lead. Avoid plastics and Styrofoam containers, including tin cans and canning jars lined with plastic, which leach chemicals into food. Unlined aluminum and tin cans can leach metals into the food. The chemically sensitive person will want to avoid gas and propane appliances. Especially gas stoves, which will be the largest emitter of fumes. A propane powered refrigerator should be OK if you do not have enough amps to power an electric one. A propane powered fridge vents fully to the outside and could be acceptable in a trailer with a small electrical load. It might be better for some to use a two burner hot plate and small convection oven. Consider using a bar sized, or apartment sized refrigerator to reduce EMFs and save on your electric bill. My fridge is 3.1 cubic feet and it's a perfect size for me. I left mine running in a garage for a month before using it. Some people find stainless fridges offgas less than the plastic ones, others disagree. Even top of the line glass door fridges don't necessarily offgas less than regular ones. You will want to sniff as many brands as you can. Buying the floor model is beneficial for some people. Washing out all residues from new fridges can help. Another very sensitive blogger, Janis reports that Sunfrost Refrigerators use fiberglass instead of plastic. But, they will bake it at high heat before they ship it to offgas it in advance. Their fridge uses less electricity than normal a fridge (fewer EMFs). They are pricey at $3000-$4000. Some like the whirlpool brand two door stainless models. It's a good idea to have a range over your stove that vents to the outside to reduce humidity and prevent mould in the home. Dishwashers that are stainless on the inside seem to be better tolerated. Although not necessarily in the kitchen, with washing machines it's best to go with a top loader. Though a front loader can be carefully maintained and cleaned in many cases for mould prevention. For a top loader it is recommended for the chemically sensitive to use a model with a metal drum, and gear dry not belt dry. Some of the Samsung models have been recommended. Disclosure: This post is not sponsored by any of the companies mentioned. As an Amazon Associate I earn from qualifying purchases through the Amazon links. Such a Great house and nice post. Is a gas stove really bad to have? Do you think running the hood fan,having a properly maintained range, opening a window and having lots of plants in the house, takes care of the fumes? If you have Chronic Fatigue or other chronic illness I would avoid it for sure. Or if you are at risk for autoimmune diseases. If you are building and have an option I would for sure choose electric. Thank you for creating it to give help & hope to others. Do you have recommendations (brand names) for small, low EMF refrigerators? As you've done quite a bit of research, I was wondering if you had come across or had any thoughts on Columbia Forest Product's Purebond plywood for cabinets. Supposedly with it's soy binder, the off gassing and VOC's are not as much of a problem. I'm considering this for our cabinets (possibly with solid-wood faces) in our kitchen, and am looking for informed opinions. Thanks! 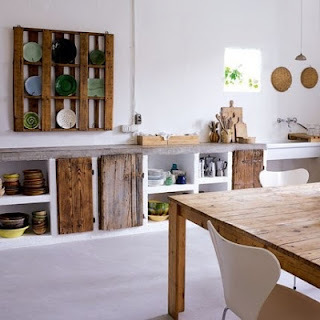 What do you think about soapstone countertops and are you familiar with paperstone countertops? I don't know what paperstone is but soapstone I think is a good choice. It's unlikely someone would react to stone and it doesnt need a sealer. but if you need multiple pieces to make the countertop then I would want to know what kind of glue is used. Made from recycled paper. VOC free, food safe no radon. They are a good use for recycled material. I've been playing with the idea of installing Marble or granite countertops in my kitchen. I agree that having a chemical free kitchen is important. Thanks for the article! Thanks for the article! I want to install Cambria in my kitchen but am concerned about what "glue" will be used for a seam. Also, I would like a glass backsplash but am not certain about the adhesive. I am VERY chemically sensitive. Can you advise how you handle the Cambria? Cambria doesn't have seams. There is an epoxy that the material is made of though, so I would try and get a scrap to test that was recently made. It's not necessary to fasten it down with anything. But check out the post on adhesives and try testing those for your own sensitivities. I'm very chemically sensitive and am reacting to my new Cambria countertops that were sprayed with a granite cleaner at installation. I contacted Cambria USA and learned that the resin is polyester-based - I am highly sensitive to polyester! Does anyone have any thoughts or suggestions? We're currently looking at the granite cleaner and what would remove a possible residue. However, my reactions [respiratory and neurological] have me thinking the problem is the resin. I thought I would be good with these Greenguard counters, but so far is it not good. Hi Linda, did the cambria ever offgas enough for you? What did you mean you didn't use glue to fasten your quartz countertop? How did you secure it? It is just sitting there. The sink holds it in place but it is heavy enough that it doesn't move. You can mechanically fasten it or use AFM Almighty Adhesive. Hi I'm sourcing for furniture for my new home and am considering aluminium furniture. However I came across sites that says that aluminum is toxic. But aluminium makers said they are not. One said that their's is made from aluminium allow grade 6063-T5 and that its non-toxic. Can anyone clarify? Thanks very much for your help. Aluminum itself is not toxic. The paints on it may be. Powder-coated is best as it cures quickly and should be tolerable. Should I be concerned? Thanks very much for your input. Hi, that is about ingesting it or breathing in the dust. How are you suppose to test for radioactivity & lead in the counter tops and in tiles etc? We are looking into buying a home and I am a little overwhelmed at all the crap in our environment and all the possible and probable contaminants. Its starting to seem impossible to buy a safe home and is almost starting to get to the point where we are just going to have to pick and choose what is absolutely necessary and what we can deal with. Granite test for radioactivity and glazed tiles for radioactivity and lead - if you want to be super careful. I had a set of cabinets built for my home from a cabinetmaker in Flippin, AR. He made a gorgeous set of cabinets that were chemical free/formaldhyde free, all solid wood. When I got them delivered to my home I was really worried about smells, but when I got close to them and even sat next to them they didn't smell and there wasn't any off gassing of any kind. I've had my cabinets in my home now for about a year and still no problems. Love them! Glad I went with healthycabinetmakers.com. How far is their geographical range for kitchen and bathroom cabinets? Cambria Quartz in your tiny home and it's absolutely beautiful. Color combination of kitchen is really amazing. Thanks for this insightful article. Looking for a non toxic utility sink. Anyone have any ideas? Is there any off gassing with a stainless steal sink? Didn't want that look but I can not find a utility sink that is not plastic. Porcelain will chip and is expensive. InovaStone has been providing quality natural stone worktops to individual and corporate consumers since 2000. Supplying you with just the best of service, our team are completely licensed to template worktops which they later on cut and polish in our work spaces, and finally return to match by the similar team. I'm really chemically sensitive and am responding to my new Cambria kitchen countertops which were sprayed using a granite solution at installation. Does anybody have any ideas or recommendations? They should avoid spraying them with this cleaning product at installation. You will have to wash it off on sides where you can reach it. I am very sensitive to chemicals and may need a new refrigerator. Also, all of my family has died of cancers (my siblings in their 40s) and I have an autoimmune disease and asthma. What can be done to have a fridge that doesn't outgas a lot of plastic into the food in it? And are the compressors always smelly and need to be run ahead of installation? I read the tips listed above, but am wondering what other thoughts people might have for me. Any suggestions on a brand? (Also - we can't have a really small fridge as we need a family sized one.) Thanks much. I have heard conflicting things about which ones are better. You may find a floor model that has offgassed or leave it in the garage running for a bit. As for which brand or type is the best for offgassing there isn't much agreement, you have to sniff a few of them if you can stand the exposures. You would think stainless would be better but that's not what I have seen. Hi Corrine, my husband and I have just purchased our first home and although I have not been tested for MCS I know I am very sensitive to inorganic chemicals and materials, as well as my son. I am not well versed in your area of expertise so I am trying my best to get a quick, as thorough as possible, education on these subjects as we are crunched for time. We are redoing our floors in solid raw hardwood and was wondering your thoughts on Rubio Monocoat Oil Plus? We also are planning on doing a nail in installation but not sure what exactly is underneath the current floors. Seeing if we have to get soft plywood is there certain brands you would recommend? And considering we get the lowest VOC possible how long on average does it take for soft plywood to off gas? Any thoughts? I do plan on having an Austin Air to help with these two renovations. Thank you so much for sharing your journey and knowledge with us all. You are very much appreciated. Using Ikea cabinetry is not exactly safe. As you have to deal with pressed board. That has formaldehyde and takes forever to outgass. If your looking for safe, formaldehyde free, chemical free cabinets check us out at www.charlesrbaileycabinetmakers.com. We would love to talk to you and help you out on your cabinetry. Hi Lindsay, Yes there is certainly a lot of info to get through! A lot of this is talked about on the blog. If you can't find what you are looking for, or it's too much information to go through, then let's set up a consultation. We can get through everything you need for your reno in an hour or less. corinnesegura@gmail.com. It is 60 USD per hour. More info on the consulting and contact page. I am very chemically sensitive & need a new washer/dryer unit. Any recommendations or ideas? Hi Corinne, You wrote "The [faucets] I have seen that are 100% lead-free are made of 100% solid stainless steel." Since Parmir tested positive, do you have another lead free faucet recommendation that is reasonably priced? thanks! The other options for 100% lead-free faucets are pricy. MGS an Italian company and Waterstone Faucets also make 100% stainless faucets. Another one I have seen is this one called Jerry. I have MCS and CFS and my big challenge is the range. I don't use gas ranges, but I struggle to find an electric oven that I can use without it making me very ill, with daily use for the first year. When I had to get a new one 5 years ago, I tried running it while I was out of the house, etc., but ended up giving it to a friend to off-gas. Hoping it will be okay now. Now in the market for a refrigerator, and not sure what to do. Don't have an outlet in the garage that can accommodate a fridge. Wish there were more options for people like us. A lot of people do the garage strategy. A small fridge using a regular plug.